I was invited to attend this sponsored event as press. As always, all opinions shared are honest and solely my own. I’m here for any chance to do a little #TransparentParenting so when The Moms invited me out for an evening of laughs about the struggles we face as parents I was all in. Then I found out that we would get to snack on the new Jif Power Ups, I thought, even better. And then when I found out the evening would be hosted at Caroline’s On Broadway with Neil Patrick Harris, I just knew the night would be LEGEN- wait for it – DARY. I wasn’t wrong. The Moms -Denise and Melissa. These women are an inspiration daily! Let me tell you how the evening started off with some amazing appetizers. Did you know that I’m a complete foodie? Everything was simply delish. Then more and more familiar faces began arriving. Did I mention this was an invite only event? I felt very blessed to be included on the invite list with so many other bloggers I respect and follow. When it was time to sit down for the show I was kind of sad that I didn’t grab some sweet potato fries on my way in. They were so yummy. Fortunately, before my belly could growl or I could get hangry I found Jif Power Ups magically waiting for me at the table. I was a little worried that they would be too thick for a comedy show snack. I didn’t want the peanut butter to glue my mouth shut and not be able to laugh out loud. My worries were complete nonsense because Jif Power Ups are perfectly made. I had the chance to try out three of the flavors at my table. Yes, I’m a greedy eater! I tasted the strawberry, the salted caramel, and the apple cinnamon. My favorite was the strawberry. And let me tell you, that was the one that I was most concerned about. I’ve never had peanut butter and strawberry together before. It was a delicious combination. I’m now on the search for the banana bars because who doesn’t love peanut butter and bananas??? My NPH selfie LOL. There was a group photo I promise! The show was hilarious. 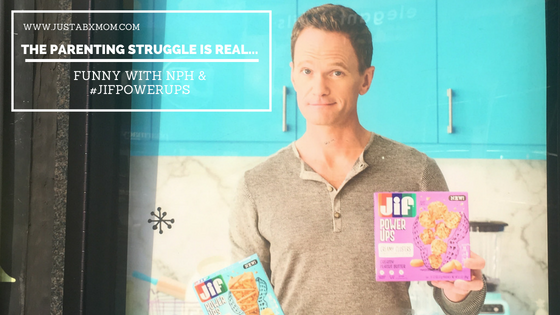 Neil Patrick Harris and a very talented Improv Troupe took on some of our every day parenting struggles including but not limited to: bedtime, waking up early, road trips and picky eaters. Spoiler: Jif Power Ups was the key to a happy family for many of the scenarios. I loved that Jif live streamed much of the performance on their Facebook page. You can watch it here! It was great to be surrounded by other parents that go through the same issues as me. Our parenting styles may be different. Our parenting situations might be different. Even our parenting languages might be different but at the end of the day we all love our children and want the very best for them. Huge shoutout to Jif and The Moms for bringing us together for a great night out where we could laugh at the moments that usually make us cry!